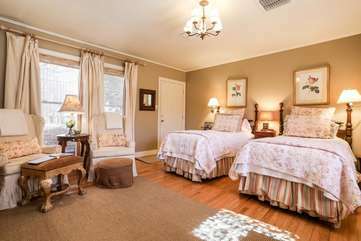 This lovely suite is located just a block from Main Street on the edge of town. Although it is adjacent to your host’s suite it is very private. Being a stylist and decorator your hostess has created a wonderful haven for the weary traveler. Inside this spacious one room suite are antique twin beds beautifully dressed in a rose pattern and accented with soft green touches. A bookshelf next to the bed offers a wide collection of books. There is also a large flat screen television and radio/CD stereo. A comfortable seating of two wingback chairs is also found in this comfortable room placed to enjoy the television or just relax. Enjoy the beauty of the back yard while eating breakfast at the cozy antique dining table and chairs. Lindsey’s Haven also offers a coffee bar with microwave, small refrigerator and small coffeemaker. The bath has a shower. Just outside the bath is a dressing table designed as an extra dressing area. For stays three days or longer a washer and dryer are available. Outside is a special treat. The back yard offers a veranda with seating. The gardens of this lovely home are extra special with an array of colors throughout the year. Wonderful place to stay. Delightful interior. Congenial hostess. Handy to everything. Would stay again! Lindsay’s Haven is a dream! We always look forward to staying here when we visit Fredericksburg, wouldn’t stay anywhere else! My sister and I had a wonderful weekend! absolutely loved this cute house. Very cozy and comfortable! Iwould definitely recommend this cute place and will go back. Couldn't have been happier with this stay! The place is exactly as pictured, plus she had it decorated for Christmas with lots of little touches. The Christmas CDs and DVDs were pulled out and set for easy access. She had fresh baked cookies and homemade muffins, coffee, orange juice, and a selection of sodas. The location is walkable to main, but if you're planning on going when its dark, I recommend driving to main street. We checked in after hours, and the key was waiting under the mat, so I can't speak to the typical check in process. BUT the best surprise was when we checked out, and we received a coupon for a free pair of earrings and a discounted pair from the nearby jewelry store! Definitely gave us a great experience. Highly recommended for girl's getaway. Definitely appreciated finding a place where we could each have our own bed! Perfect for two! Lots of amenities, including a mini refrigerator and a washer/dryer. Very clean and enjoyable! Look no further than here for a fun getaway to Fredericksburg! We spent a girls’ weekend getaway, and everything was perfectly arranged, beautifully organized, and had so many thoughtful touches that made our stay that much more special. This is hosting at its finest! Thank you Gastehaus Schmidt for such an incredible weekend! What an adorable BNB! They have thought of everything you could want when away from home. It was super clean and well decorated. Great wifi which was great b/c Fredericksburg had spotty cell service overall. I especially loved the fresh banana bread and fresh apples, peaches, bananas laying out at our arrival! Also the fridge was stocked with lots of water, milk, OJ, butter, and sodas. The coffee bar had both regular and decaf coffee with creamers and sugars. I was even happy that they had a small fan in the closet to put on for white noise b/c it is so quiet there! I appreciated the extra towels and make up remover wipes! We walked to the center of downtown from the BNB but its kinda long if you plan on wearing uncomfortable shoes. Otherwise, it was great to walk around the neighborhood and look at all of the cute houses on the way to downtown. Check in was super easy with a key left at our door b/c we came in late. Check out required us to drop the key off at the downtown main building of the business who runs it which was kind of inconvienent due to rare parking downtown but doable. This was such a cute BNB and I would not hesitate to stay again! Lindsey's Haven was absolutely perfect for our mom's getaway weekend. The space is beautifully decorated, extremely clean, and walking distance to Main Street. The special touches which included banana nut bread, cookies, and water made our stay extra special. Lindsey's Haven will be our go to from now on. Thank you! Such a cute place! Our host provided bottled water and had complimentary breakfast and cookies which were all so delicious! We really enjoyed staying here and look forward to going back! This was was the perfect place for weekday business travel! Wifi was easily accessible. The host provided an assortment of cold drinks, fruit and breakfast muffins. Mary had a great movie selection and wonderful books. I enjoyed the beautiful view of her garden, and loved having a private driveway. The washer and dryer are a nice amenity. Would highly recommend this lovely guest house! Wonderful BNB! Highly recommend! Muffins, coffee & OJ provided for breakfast. The room is equip with anything you’d need and Mrs. Lindsey is so sweet and accommodating. The beds are comfy and the curtains keep the room dark in the morning. Bathroom was clean & stocked with essentials. Will definitely be back! Thank you! Lindsey Haven was perfect. The room was beautifully decorated. And Mrs. Mary was so considerate. She had everything from cards, games, movies, books to extras like make up wipes and fresh fruit available. She had baked chocolate chip cookies for us upon arrival and brought us delectable apple turnovers and homemade bananas muffins for breakfast. Our stay was simply divine because of her hospitality. This house was a 4 block walk from the top of Main Street. We couldn’t have picked a better location. This was a wonderful space for a girl’s trip. A couple blocks from Main Street. The host left cookies for us when we got there and muffins for breakfast. We would totally stay there again if the chance arose. Very hospitable and great location! Loved Mary bringing us homemade apple muffins, banana bread and chocolate chip cookies. Couldn't have had a better time and host.